This is part four of our multi-day series on The Zombie Brain. Be sure to visit Oscillatory Thoughts tomorrow for symptom 5! Let's face it, zombies aren’t known for their oratory skills. Usually you’ll hear nothing but a collective set of moans as they’re pounding at the barricaded doors. 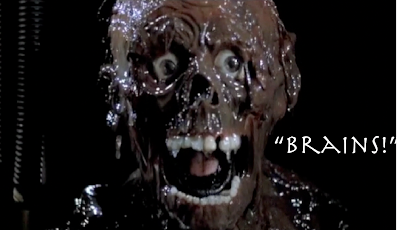 Keep in mind that the most fluent phrase we ever hear Tarman say in Return of the Living Dead is "Braaaaaains!" At best you’ll get a disjointed burst of individual words. For example, a somewhat intelligent zombie might utter into the walkie-talkie of a recently consumed police officer, “send... more... cops...” in order to get a new delivery of fresh meat (as observed in Return of the Living Dead). But that would be considered the Shakespeare of zombies. This type of speaking is called telegraphia, characterized by the fact that the words are present, but the execution is jammed. Neurologically, this relates to a specific disorder known as expressive aphasia or, as it is classically known, Broca’s aphasia. Now in the normal living human, this language production ability is mediated by an area of the brain that rests just behind your temple. More often than not, just behind your left temple. 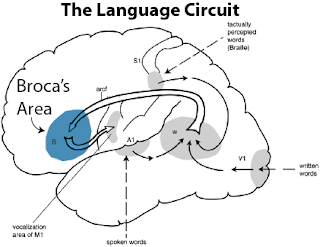 Broca's area is named after Paul Broca, who described the language deficits of Patient "Tan." Tan was reportedly was unable to say anything but the word "tan" after this region of the frontal cortex was damaged. (Historical side note: Tan could actually say many other things however, they were all just vulgar profanities. Apparently French neurological societies frowned upon the idea of naming him Patient "Foutre!"). Okay, back to zombies! Zombies don't just have a problem producing language, they also don't seem to be able to comprehend it either. They never respond to verbal commands and rarely seem to stop read road signs (hence they are chronically lost). This inability to comprehend language reflects another type of classical deficit called receptive aphasia, known by it's more common name Wernicke’s aphasia. You guessed it... that's because the guy who discovered it was Carl Wernicke. Wernicke's aphasia comes from damage to a different region of the brain. This sits farther back in your head, at the junction of the temporal and parietal lobes (basically behind and slightly above your ear). What does this tell us about the zombie brain? 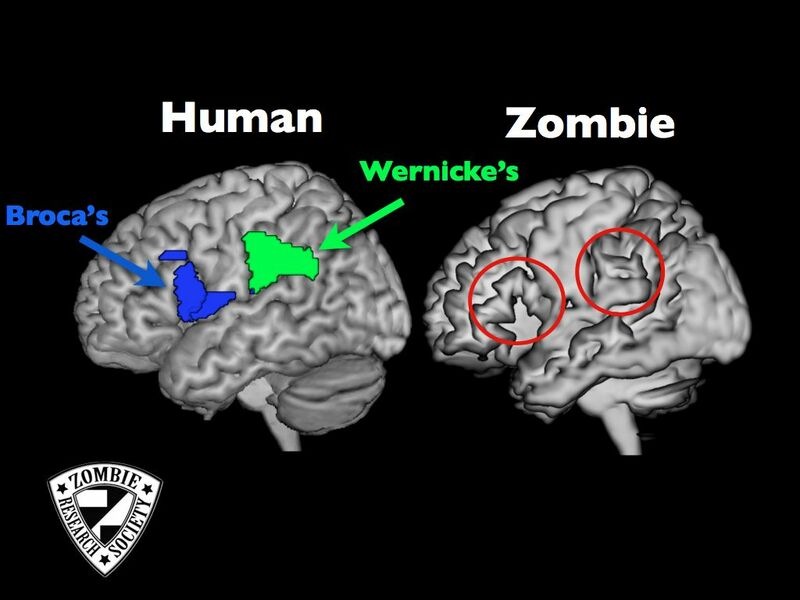 Well it would appear that the frontal language production areas and the temporal/parietal language comprehension areas are both atrophied in the zombie cortex. Since these regions communicate with one another via a large bundle of white matter called the arcuate fasiculus, its safe to say that this “arcuate circuit” is obliterated in the zombie brain, as well as the frontal and parietal language regions. 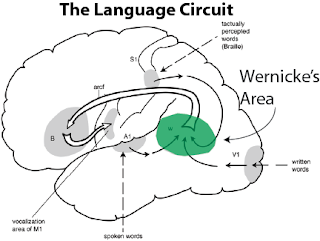 Damage to the frontal (Broca’s) region leads to expressive (Broca’s) aphasia, and damage to the parietal (Wernicke’s) region leads to receptive (Wernicke’s) aphasia. Thus, all language and communication skills would be severely disrupted in the zombie brain. Bottom line: Don't try talking to a zombie. It's not worth your time. So technically the expressive zombie aphasia could be due to damage to underlying white matter causing a severe apraxia of speech. Damage to Broca's area doesn't always cause a sustained Broca's aphasia (Mohr 1978) and it is actually damage to underlying white matter that is responsible for some types of expressive aphasias (Dronkers 1996). Now your MR reconstructions clearly shows grey matter atrophy, but could this be caused by prior white matter degeneration which eventually propagates to the soma? Thus presenting itself in the chronic stage as full on grey matter damage? If the origin of the zombie symptom is in white matter maybe there is a chance to stop it before it progresses, is there a hope? Clearly I need to read up on my Zombie literature... Just some pre-halloween thoughts. Right. There's the "Broca's pinky hypothesis" (that Broca poking around in head wounds with his finger broke the arcuate and thus caused his aphasia). We also simulated fiber tractography of the zombie arcuate to show this, but it doesn't match up with the white matter in the zombie Colin brain. However, that said our hypothesis is that the pathogen attacks grey matter first. I'm working on a model that the time-to-resurrection predicts the degree of language/cognitive/motor deficits via atrophy from hypoxia. this is awesome, so basically zombies have disconnect syndrome, nevertheless they can comprehend!! lol.